The Internet Corporation for Assigned Names and Number (ICANN 57) public meeting may have suffered a setback as the Hyderabad-bound cargo ship carrying hi-tech equipment belonging to the organisation were affected in a fire incident, reports ITRealms. ICANN public meetings, ITRealms notes are usually a large-scale technical event, which include the visible parts like microphones, monitors and cameras are the tip of an iceberg. According to sources close to ICANN, beneath the surface, there are miles of cable and hundreds of pieces of equipment providing connectivity, and enabling engagement and the seamless presentation of ICANN sessions. 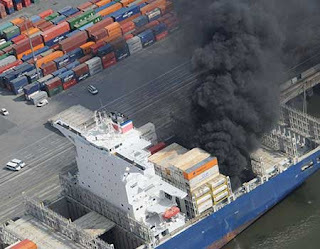 ITRealms recalls that on 1 September 2016, an explosion caused a fire on a cargo ship docked in Hamburg, Germany. In addition, ITRealms reports that it took 150 firefighters four days to extinguish the fire, even as the ship crew initially tried to extinguish the fire and sustained slight injuries. “No one else was hurt,” our source said, pointing out that reports indicated that welding in the cargo hold caused the accident. The ship had departed Helsinki, Finland, after ICANN56 and the equipment was bound for Hyderabad, India via Mumbai.